Let my life show forth Thy praise. Amen. 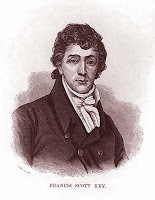 Francis Scott Key will always be remembered for writing the words to what has become our National Anthem in 1931. This poem however, written in 1817 by Mr. Key is a powerful testimony to His faith in Christ and his gratitude for Salvation. Personally, I like the third verse the most. The last stanza is hilarious because he mentions how vainly his lips would express what he felt inside about Salvation - for someone who is "at lost" for words, he sure did a good job.